Lately I’ve been enamoured with all things Habu! If you’re not familiar with them, they are a Japanese textile company that makes some of the most luxurious, intriguing and unusual yarns. Most people seem to start their Habu experience with the Kusha Kusha scarf kit since it’s a small project and not too expensive ($24 U.S.). And it uses their silk stainless steel yarn and who wouldn’t want to check that out! – Fluffbuff’s photos from a recent Habu trunk show. – This amazing Kushu Kushu Jacket from Knitsane. 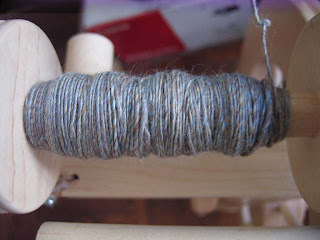 This is the first semi-decent handspun I’ve made on my wheel. I don’t know the name of the colorway (Janel?) so I’ve named it “Fruit Loops” since it reminds me of the cereal that I haven’t eaten since I was in the single digits. It’s still pretty uneven. 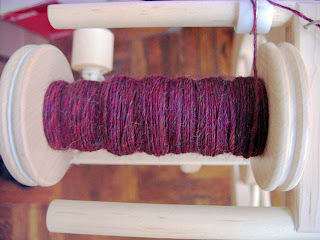 The second bobbin was much thinner and more consistent and you can really see the difference in the two plies. But these colors are so crazy bright that it just makes me smile. 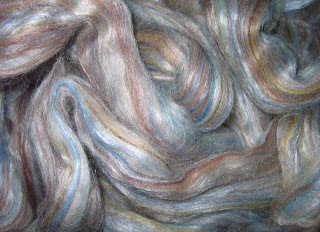 This is another merino/tussah blend that I bought at the Maryland Sheep and Wool festival from Cloverleaf Farms. 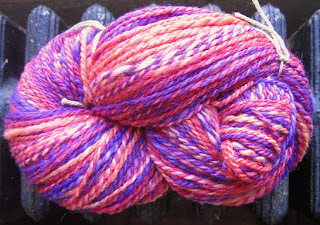 The colorway is called Seamist and I just love it! This was a super easy knit and perfect for summer since it was so light weight. 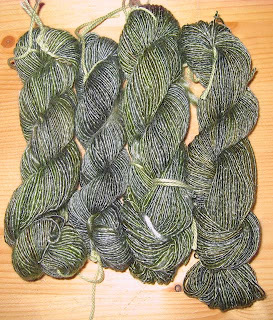 I had about 85-90% of one skein left of the Kidsilk Haze and I tell you, you get a lot of mileage out of one skein of this yarn. 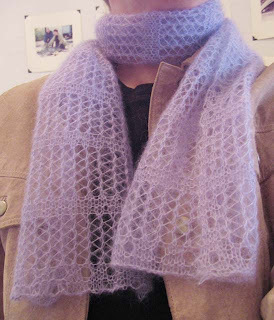 I would have liked the scarf to be a tad longer but I had trouble ripping the Kidsilk Haze from my previous project so I wasted a bit on that. 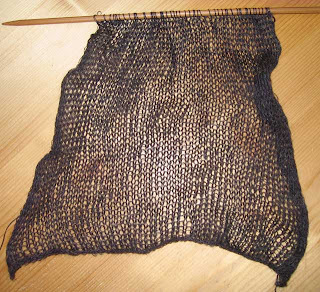 Lesson learned – make sure you know what you want to knit with Kidsilk Haze as it’s nearly impossible to frog. It’s also a bit difficult to work with at first but once I switched from regular Addi’s to the Lace Addi’s that helped enormously and eventually I got used to the yarn. Other than that, it’s a beautiful yarn. The edges came out a bit wonky. I’m not sure that I used my new blocking wires properly. 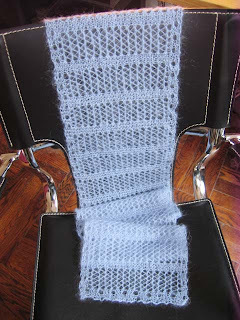 But I think it’s a pretty scarf and will be nice for early Fall and Spring. I finished knitting Wisp yesterday and now I’m blocking it with my fancy new blocking wires which were an awesome b-day gift from my dad. 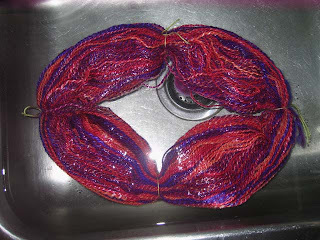 Earlier today I plied up my two bobbins on my spinning wheel and here it all is soaking in the water. 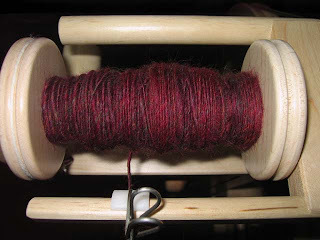 And can I just say that I will never ply on a spindle again! 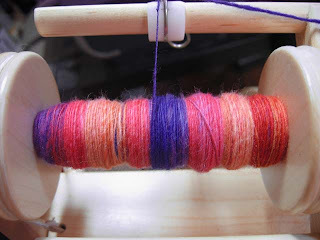 As I had hoped, plying on a wheel is so much easier. 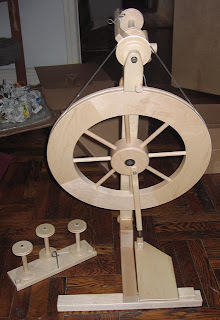 I still have plenty of love for the spindles – just not for plying on them. In case you think I’ve neglected my spindles for the fancy new wheel… This is all of the Funky Green merino/tencel fiber – spindle spun and ready to be knit. I still love the spindles too! 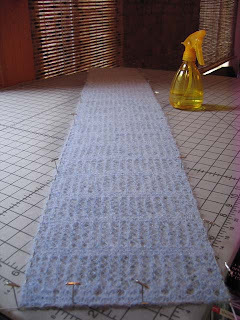 I ended up only getting 368 yards so not enough for any of the lace scarves in Victorian Lace Today. 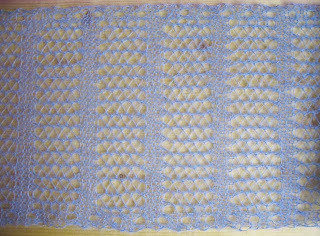 But that’s OK. I’ve got plenty to make the Branching Out scarf from Knitty. First I need to finish Wisp which is almost done. It’s starting to look more and more like yarn! I’ve finally got to the point where I’ve got a decent rhythm going and am not stopping and starting. I figured out that a large part of my initial problems were due to not having my drive band and scotch tension set properly. 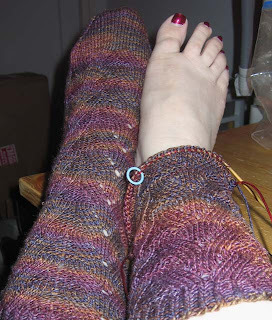 I was having trouble treadling and the yarn was being pulled in much too quickly. Now I’ve got it working so that I can focus more on my drafting. It’s still uneven and I still need a lot of practice but I feel like I made a big leap now that the settings are better suited to my needs/skills. 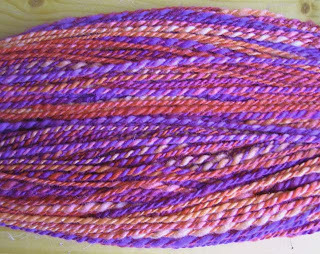 OK, so this is the first stuff I’ve spun on my new wheel that even remotely resembles yarn. It’s still pretty uneven, over-twisted, under-twisted and all those fun things that beginning spinners do. And I’m still having a lot of trouble getting a good rhythm going but it’s a great improvement over what I was spinning at first.